VMware Certification Marketplace: How is Virtualization Different than Cloud Computing? How is Virtualization Different than Cloud Computing? For the majority of us who aren’t experts in the world of IT, there’s a lot of confusion about cloud computing and virtualization. A common misconception is that these two strategies are interchangeable and synonymous with one another. While it’s true that they are related in several ways, it’s very important to understand the fundamental differences between cloud computing and virtualization - especially when making important decisions for company or organization. The director of product marketing at VMware, Mike Adams, described virtualization as the “software [that] makes it possible to run multiple operating systems and multiple applications on the same server at the same time.” This means that virtualization software allows users to overcome physical hardware incompatibilities. In other words, virtualization software provides the physical infrastructure that allows cloud computing to be executed. 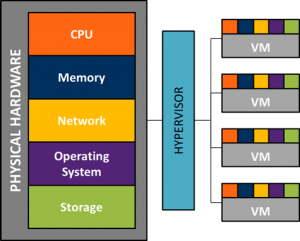 See the diagram (Source: VirtualCommand.com) to the right: the virtualization software, called a hypervisor or a virtual machine manager (VMM), runs on the physical hardware of your computer and manipulates it to allow you to run virtual machines (VMs) that would otherwise be incompatible with your computer or operating system. The ability to access and operate virtual machines through virtualization software is one form of cloud computing. For example, it is not possible to run certain Microsoft applications on the Mac OSX. One way to overcome this obstacle would be to install a form of virtualization software, which would allow you to virtually run the Microsoft Windows operating system on a Mac computer. The service (having the ability to run MS applications on your Mac) is what we call cloud computing. More basic forms of cloud computing include internet storage services, like Dropbox, and webmail services, like Gmail. These services allow you to access stored data and information (in the “cloud”) from a remote location via the internet. Adopting a cloud computing strategy at the enterprise level is much more complex and integrated than basic webmail, which is why virtualization software is usually a great option for businesses. You can learn more about the fundamentals of virtualization with this DVD training program from VMware, or read more about how virtualization can save you money, here, on the VMware Certification Marketplace blog. I am very impressed with your post.And you share a good learn-able articles which is very useful for me and as well for all to have a new experience for the future.And you have mention about the cloud computing very clearly that we can get it to mind..Thank you for your post.. This category is looking at both virtualization and cloud security. At first will blush these seem like the same thing. But it will a bit more complicate than that. First, the cloud was not a technology. Rather, it was a business construct. That meant that all of the deployed technology was at the mercy of contracts, not products. These contracts are determining what you can and can't do.Thank you very much for your post. • Nice information in the post....Keep on sharing.. Useful information about MSBI, i am looking for best msbi online training. It's True information.Thanks to sharing. AWS is designed to allow application providers, ISVs, and vendors to quickly and securely host your applications. Credo Systemz provides the best AWS Training to get your certifications easily. Excellent and useful blog, waiting for more post like this.